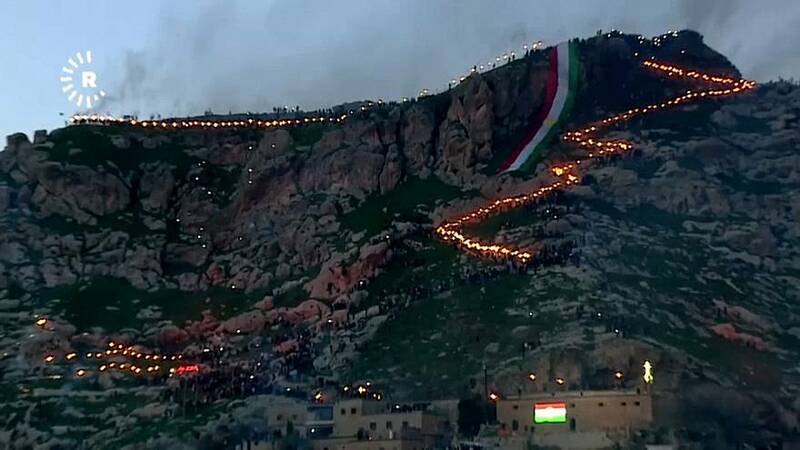 Iraqi Kurds celebrated Nowruz – the traditional Kurdish New Year – with a torchlit procession up the Akre mountain in Iraq's northern Kurdish region on Wednesday night. Thousands of people, many wearing traditional Kurdish clothes, carried torches, set off fireworks and gathered round bonfires to dance and a huge Kurdish flag was unfurled on the side of the mountain. Millions of Kurds celebrate Nowruz on 21 March, on the first day of spring. The festival is celebrated by Kurds in Iraq, Iran, Turkey, and Syria and is also celebrated as the Persian New Year in Iran. At least 30 million Kurds are thought to live scattered around the Middle East, but only in Iraq do they enjoy meaningful autonomy.